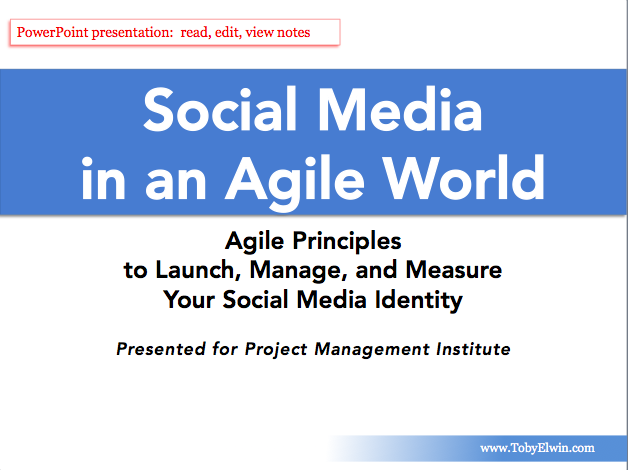 Very pleased to present at Project Management Institute New York City chapter on Agile social media. Longtime PMI volunteer, Steve Nosal, and myself presented Agile project management methods as a perfect blend to create and manage social media impact. Agile social media presented a great opportunity to formalize some thoughts from my Lean into social media post and present to a very active and engaged community. Agile project management puts the customer at the center of the effort, relies on rapid prototyping, and transparency. Social media feedback, testing, and measurements are Agile project methods. User stories rely on persona methods. Many thanks to PMINYC for the invitation. You can download Adobe Acrobat or PowerPoint version just below. To view presentation within this site, scroll past. View below. Invite me to speak at your event. I was certain you would have liked the little train slides. With a little more time I could have had your winning smile added. Of course when presenting social media to a project management crew it was easy to mention your project management site as a great resource. I appreciate all the work you have shared through your page and around the web. I never got a draft to you, as I hoped, but know your insight would have improved it. A bit of a cautionary tale when feedback is sought, as you need both the time to reflect and rebuild and time has its own conspiracy. Very interesting and useful perspective on combining two topical subjects: social media and Agile. I read your interesting (and comprehensive!) slide presentation to prepare for an important meeting with a social media juggernaut. Nice work. I’ve not seen anything quite like it anywhere else. Social media is as real time as the relevance of any other conversation, to me when I have talked with so many individual and volunteer organizations, the challenge remains – where to find the time to achieve true engagement. Agile makes sense. How have you managed your social media engagement? Do you have pick and plan or does it work itself out? In process mapping with clients have you used Lean principles? What makes Lean/Agile seem to work in this context? As you know you can either do more of something or do something more unique. Thank you for your comment Nauman. Of course, how was the meeting with the social media juggernaut? Meeting was fruitful (as to who it was with, think of the company that is largely credited for introducing social media to the masses; the one whose initials are F and B). They wanted to hear my thoughts on a social media strategy for one of their experimental products. I don’t do much process mapping anymore as my focus is more software products than projects (although I suppose I can find a way to apply swim-lanes to my products if I really tried). My approach is more conversational and a less structured way to get to the customer’s pain points. I then work to evolve my products to help. My engineering teams use as Agile (storyboarding and then 2-week sprints) to develop the software. Haven’t yet brought Lean into the mix. I hope the engagement leads to more dialogue. If I recall our work together I know the conversation engaged new ways and new thoughts for exploration. The great benefit of Agile and Scrum are the customer stories which keep the customer as a focus. Any 2 – 4 weeks with working product as well as the Sprint review to really improve the ability to estimate as well as incorporate natural changes one finds working on timelines. People ignore iteration at their own folly. There is little change management left that uses unfreeze > change > freeze. What are you going to freeze when the system and environment are in constant motion. It is more about awareness > adoption > resilience. Here’s a good post on Agile Vs. Lean, What’s the Difference?. Pain and opportunity, two sides of the same coin that lead to very different conversations. If you flip the customer pain point to customer opportunity how does the conversation change?